Can someone tell me what a typical brake specific fuel consumption would be for a street ported single turbo rotary? In the neighborhood of 0.45, depending on power level. I was at .80 last time I dynoed! What type of seals ? What type of porting ? I have seen big diffences between engine builders building esentialy the same type of engine. Last edited by RICE RACING; 09-28-03 at 06:22 PM. Peter's got it right. I've seen 0.60 to 0.65 typically on pump fuel and moderate loads. Now how did I know I couldn't get that pass you! You would be lucky to get that on a non-turbo engine. Crack kills. Hahaha yah, whoops. I'm still jetlagged, yeah, that's the ticket! Brian's right - 0.60 lb/hp*hr is normalish. Though I'm interested to see what the 13B-MSP could do in a "frugal" mode. On gas at 600 rwhp it was around 0.77. On methanol at 650 rwhp it was around 1.9! Just for comparison with a buddy's 800 rwhp supra it was 0.72. 0.60 for multi-valve piston engines, but we use 0.65 for rotaries - that's AVERAGE! Keep in mind, a low BSFC is what's desired. I wanna point out that BSFC number on its own doesn't represent engine efficiency or lack of it. It must be provided with corresponding air/fuel ratio to have any meaning. Coul you share actual AFR or Lambda at measured point? Also, is your BSFC based on rwhp figure or some back-calculated brake power? we have some bsfc info from mazda, the 0820 10A, the 13B and 20B cosmo engines and the 787B all have bsfc info. I just checked Cosmo training manual and both engines have very low (for rotary) BSFC at peak torque which is expectable, but BSFC at peak power is much higher. 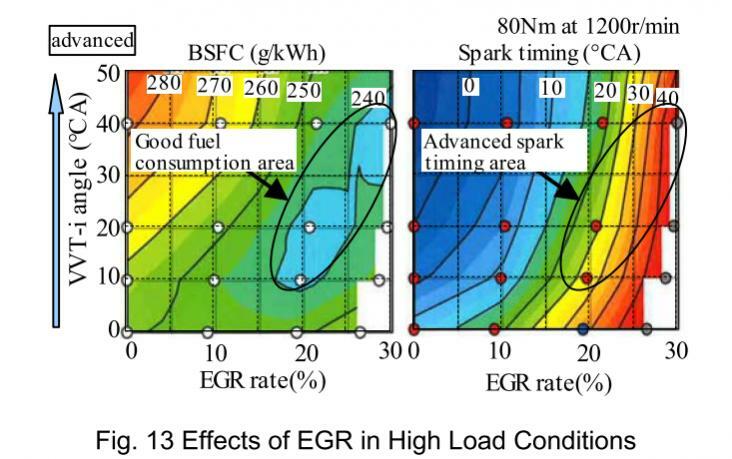 There are factors like higher pumping losses from higher exhaust backpressure and higher friction which will hurt engines overall efficiency at peak power, but large part of such huge BSFC increase lies in much richer mixture, which is used to keep EGT's in check to preserve catalyst life. here is the R100 10A. its the non emissions version. And the peripheral port engine BSFCs dip into the mid .4n range... at full load. What is the basis for this statement? BSFC = fuel mass used (potential energy)/mechanical energy produced. That is basically the definition of efficiency. AFR is irrelevant to BSFC, assuming the engine is optimally tuned. By using AFR, you could determine volumetric efficiency (sort of), but volumetric efficiency is only useful in determining power potential, not fuel efficiency. For example, a rotary engine and a diesel engine can have similar VE, but vastly different BSFC, guess which one uses more fuel to do the same job? In the engines development world, BSFC is probably the single most important variable for current developments, although some are arguably more concerned with engine out emissions. 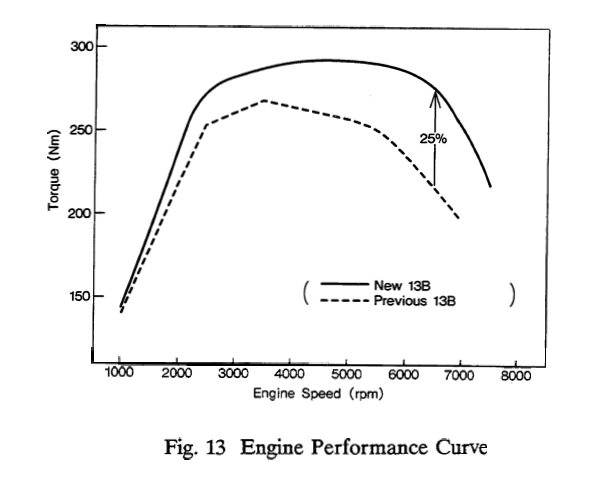 Modern rotary engines (non Mazda) can get down into the <.4 lb/hp-hr range at peak torque. Well, thats the case, how do you determine that the engine is optimally tuned? We can make general statement that all homogeneous charge internal combustion engines, rotaries alike, are operating at lowest BSFC with about 15% lean mixture. We know that turbo rotary operates rather with 30% rich mixture to control internal conditions, so its not optimally tuned, its tuned to survive, BSFC number at such conditions can't reflect engine's true efficiency. But BSFC of given fuel at given lambda can reveal brake specific air consumption, which doesn't vary so wildly like BSFC, its lowest at slightly rich mixtures (reason why given amount of air produces maximum power at these very conditions) and higher at lean mixtures. Efficiency evaluation based on specific air consumption shows true efficiency of given engine design. In other words, one can have really good engine design with poor distribution of fuel, it will exhibit high BSFC, but it still will be able to produce high power. 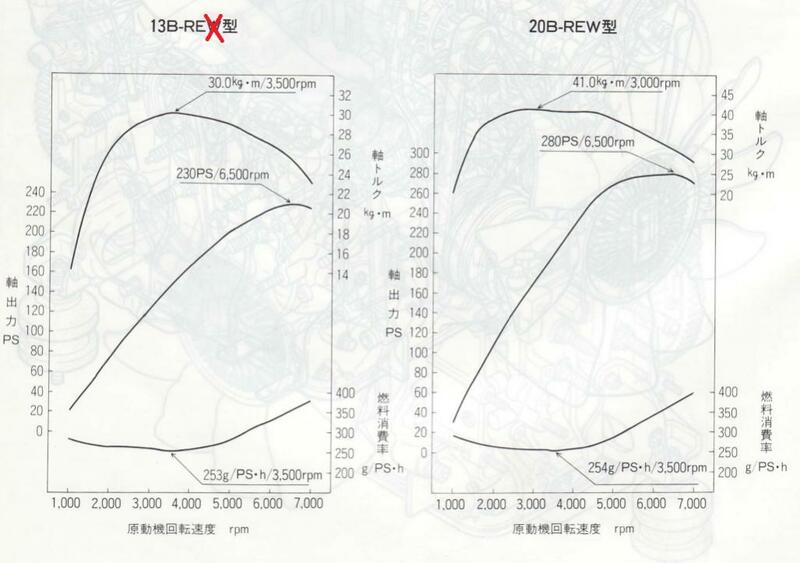 On the other hand, something with bad design, like rotary, can show very low BSFC at certain conditions, but it won't produce as much power from given amount of air like former engine. specific air consumption basically equals VE. My argument is that VE is irrelevant in terms of fuel efficiency. You can have a super efficient engine from airflow point of view, and still horrible fuel economy, because BSFC depends not only on VE, but also on thermal efficiency and combustion characteristics. The driving factor in engine design is how far can we drive a vehicle with given power requirement on a given amount of fuel. That equates to BSFC. Obviously there are power/weight and power/volume variables that are not included in this, but within a 'reasonable' range of engine size/weight, it does not matter much given the vehicle weight depends so much on all the silly navigation systems and portable bluetooth DVD hands-free toothbrushes or whatever they are putting in cars now. NASA/Curtiss Wright were able to achieve .36lb/hp-hr with stratified charge rotary engines. I know of a couple of current stratified charge engines in development. The one I work on I can't talk about much, but it is close to this efficiency range at ~1hp/lb of engine weight, on heavy fuel. I think it's important to have a basic understanding of engine dyno development work for this discussion to make sense. Normally when you are doing engine dyno work, you do a full mapping of engine parameters. So you take your control unit, whatever it may be, and set it up for an engine dyno. Typically you use a heavily modified stock ECU or a special development ECU (really expensive standalone) that allows you to do realtime tuning of basically every single thing in the ECU. Then typically you pick rpm and load points and take data snapshots at each point to build your map. Load points are typically engine torque in newton-meters. It's not like doing WOT pulls on a chassis dyno or cruising around on the highway with a laptop hooked up. So we take our engine and set it up for the dyno. At each rpm increment, let's say every 400 or 500 rpm, we increase the torque output up to the full load point. At each point we can measure the BSFC, volume fuel flow, ignition timing, combustion information if you are measuring that (cylinder pressure etc), air fuel ratio, EGT etc. So you are going to pick RPM and torque points at or under these curves. Solid line = 13B-REW, dotted line = S5 13BT. If you are using a default/production/fixed calibration, well the BSFC naturally changes as you go under heavy load but it also changes from the ECU commanding a richer mixture. If you are doing development work at each torque point you can sweep AFR. As you sweep AFR, your BSFC will change, your combustion stability (Coefficient of Variation of Indicated Mean Effective Pressure) will change, and so will exhaust temperatures and knocking noise. Your BSNOx, BSCO, BSHC, etc also change--those are important for meeting emissions standards. If you're trying to figure out variable valve timing at cold start, you sweep your valve timing settings and then maybe adjust your injection timing to minimize your BSHC. That helps you tune your cold starts so you can actually pass government emissions standards and build the car. Getting back to BSFC. You can put an engine on an engine dyno and run it at say 1200rpm. As you lean it out, BSFC will go down but COV_IMEP will get worse and you get misfire. Pre-Renesis rotaries need richer mixtures at low rpm in order to keep COV_IMEP (or Sigma IMEP) under control. Then you change rpm and torque in various increments to get readings. divide by .735 to get g/kwh . I'm too lazy to convert to English units. Anyway, this is basically terrible BSFC by modern standards. It's about 340 g/Kwh, and your modern gas engine will be around 250-280 g/Kwh. Super fuel efficient gas engines are getting close to diesels now. Using special valve timing techniques (late intake valve closing, de-throttling, etc) and cooled EGR there are now gas engines that getting close to 200 g/kwh. The Prius engines are like that. So talking about BSFC... let's talk about the current (3rd generation) Prius with the 2ZR-FXE 1.8 liter engine, utilizing a cooled EGR system. Here's what's going on in this graph. The Prius has a geometric ("static") compression ratio of 13:1. It actually controls load by advancing or retarding the intake valve timing, in addition to using the throttle. At the condition of 1200rpm, 80 Nm torque there are a gazillion combinations of throttle position, valve timing, and EGR flow rate. Looking at the right graph, start at the "0" point. It's not mentioned, but the throttle is wide open. 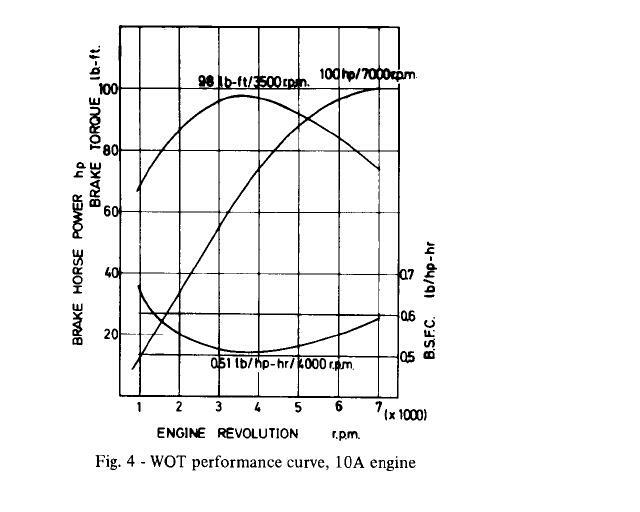 Look up along the graph and you will see the intake cam advancing, increasing the amount of work performed. This should help BSFC, but unfortunately the engine wants to knock and we have to pull timing. So we add cooled EGR--this is almost like water injection for the OEM's. Looking right across the graph, we add more EGR and now we can advance the ignition timing. This results in the optimum balance of EGR, throttle position (wide open in this case), and spark timing. in know we in the rotary community refer to the cosmo 13B engine as the RE, but Mazda uses the REW suffix, as the REW actually refers to the twin turbos. It's me David. Could you explain briefly what's all this about ? I totally do not understand. Does this has to be done during the engine is in dismantled condition or not ? Please reply to my private email address as I seldom online.